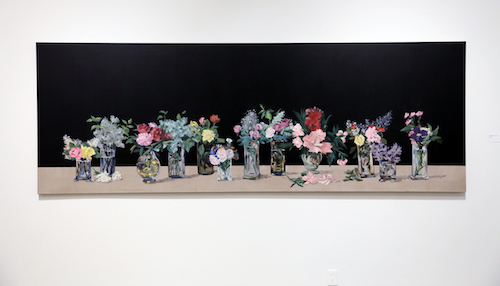 Jessica Halonen, A Clock Stopped (Flowers after Manet), 2017, acrylic on linen, 4 x 11'. Jessica Halonen’s exhibition has more than the color blue in common with author Maggie Nelson’s Bluets (2009), which features a prose style that threads together 240 fragments around blue and its many historical associations. Halonen’s elegantly precise exhibition comprising four discrete works advances an appreciation for refined craft, art history, the aesthetic of wonder, and scholarly research into the eighteenth-century discovery of Prussian blue. Similar to the literary snippets of Bluets, each contribution to this show commingles the familiar with the inexplicable, science with enchantment, history with illusion. Yet taken together, the installation also hums with classical representations of beauty. New Years Gift 1883 (Flowers after Manet), 2016, is an iconic blue cyanotype reproducing one of Manet’s last still lifes. Halonen printed the appropriated image on a piece of unstretched linen and juxtaposes it with an uncommonly long horizontal composition titled A Clock Stopped (Flowers after Manet), 2017. This acrylic painting depicts twelve bouquets against a nondescript black ground. Gestural yet homogenous brushstrokes that make up the colorful peonies, roses, and lavender glow like stained glass and offer a contrast to a graphic beige painting Mother’s Day (White Vase), 2016, which hosts a generic silhouette of vase incised with bands of parallel lines. The sole sculpture in the collection, Untitled (Interior Wall), 2016, imitates a stud-and-frame construction. Wrought in reclaimed pine and set perpendicular to the gallery wall, a decorative and heavy plank of marble takes the place of a cross support in this faux wall framework. But as with the transitional light of the blue hour, that fleeting moment of time between day and night, Halonen’s work also reminds us that Manet’s realism, cut flowers, polished marble, and this hue are unstable, unknowable, and ephemeral.